Successfully Added Bluetooth Car Kit - Bluetooth Calls and MP3 Music to your Shopping Cart. Easy to use MP3 car kit has convenient entertainment functions along with handsfree Bluetooth operation for todays cell phones. This handy little gadget has managed to combine two of todays most popular add-on technologies for the car and build them into one device. 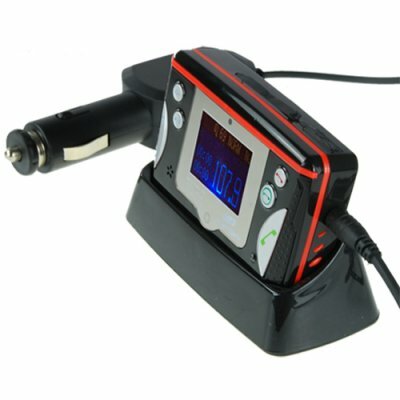 The Bluetooth FM transmitter will pair with your mobile phone allowing you to make and receive calls using the transmitters MIC and your cars own speakers! You can also listen to your MP3 collection using the FM transmitter, it is as simple as plugging in a USB stick or SD card and hearing the beautiful digital sound over your own cars stereo system. When you answer a call your music will be paused automatically and when the call is ended the music will resume. This product is easy to install, simply plug it in to your cigar lighter, choose a frequency for the unit, tune your radio and your set. The unit also features basic button controls for both making/receiving calls and simple music navigation. In todays busy environment, a handsfree car kit has become a necessity, by pairing this simple unit to your car stereo you can listen to your tunes and never miss a phone call! This model Bluetooth accessory is in stock now and available for single sample or bulk orders. Make handsfree mobile calls in your car. Easily take music off your computer and listen through your car speaker system. Pauses music automatically when you have a phone call. Powered by car cigarette lighter electrical socket. Remote control. Very easy setup and usage. Simple Installation; plug-in and play! Easily contacts phone. Approaches for any car. A sound pure. The subscriber hears me well. If to use only batteries the sound becomes more silent. This product works great. The sound of the music is crystal clear through the speakers of the car. I had my girlfriend call me with the bluetooth function and it was so clear i thought she was calling directly from the phone. The only problem is the manual is not very good. If i wasn't good with tech I would have a bit of trouble working the device.